The first step is to plan your space. 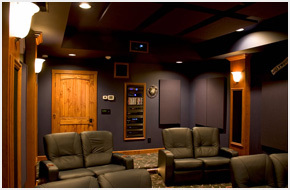 Will you have a dedicated custom home theater/media room or will your system be in a multi-purpose media room? Either way can be fantastic. 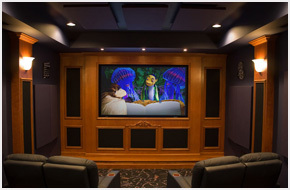 A dedicated home theater is designed specifically for entertainment: enjoying movies, sports, TV and video gaming. 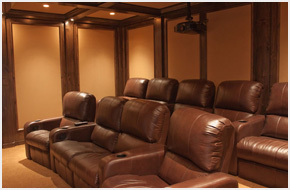 Basements, attics, bonus rooms, or spare rooms are great as dedicated home theater spaces. A media room serves for more than entertaining. 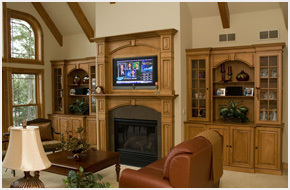 A family room or bonus room usually doubles as a media room as well. What is a home theater? A recital stage for your kids? Movies better than the commercial cinema? Football on the 50 yard line? Slumber party paradise? Front row seats at the concert? The ultimate video arcade? Yes! A home theater offers you, your family and guests an entertainment oasis, away from the crowds and noise of commercial cinema. No more, standing in line, leg room issues, heads in the way of the screen or sticky floors. The true home theater experience can take you away to another place. You become so immersed in the film you feel like you are part of the movie. Step inside your personal theater, with the smell of fresh popcorn filling the air. One-touch control starts the action, the lights fade slowly and the movie starts…it is time for an unforgettable experience. Whether you are entertaining guests or simply relaxing around the house your Media Room should be an extension of your lifestyle. It should fit into your home seamlessly, provide all the amenities that custom audio video technology has to offer while being simple to operate and enjoy. In many homes the family room serves at the media room. The focal point in many family rooms is a fireplace in the middle of the wall. Placing a flat screen TV over the fireplace mantle is a very popular design option. However this may not always be the best location, sometimes to one side of the fireplace may be better. This may also be paired with a sound bar, stereo speakers or 5.1 surround sound system.